Shay Savage: SURVIVING RAINE $0.99! 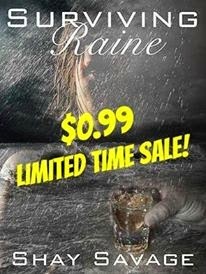 Surviving Raine 99 cent sale ends March 1st! Get it while you can! Maryse, Maryse.net - One of my new “best book ever” books. OMG I am OBSESSED with this story, and those who recommended it to me were SO right. Absolutely engrossing. I LOVED IT! One alcoholic jerk, one gentle soul, one life raft in the middle of the Caribbean. He knows how to survive the elements, but can he survive his attraction to this woman and their tangled pasts? Get Surviving Raine now, before the price goes back up!